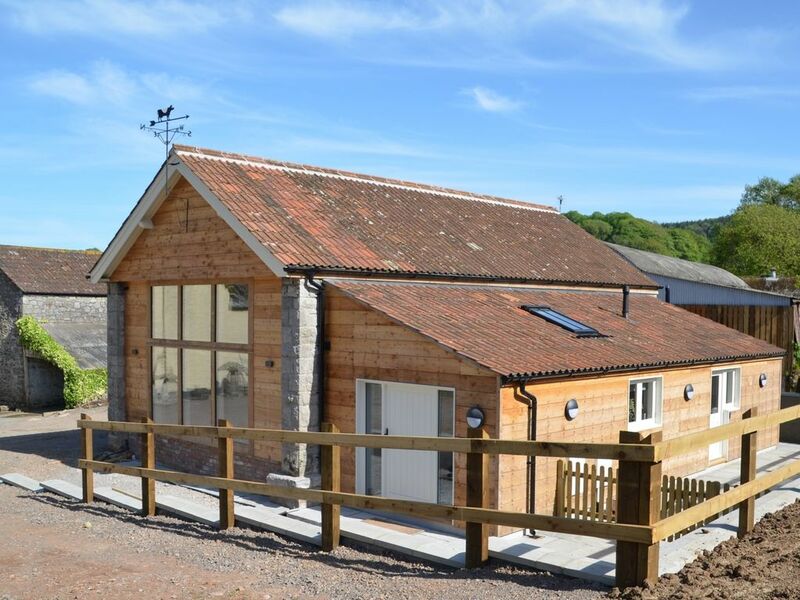 This beautiful detached barn is situated in the heart of the owners working farm and is located between the popular villages of Burrington and Blagdon. Situated at the foot of the Mendip Hills an Area of Outstanding Natural Beauty walks are in abundance and are literally accessible from your doorstep the local pub is just a field s walk away. Charming village pubs are in abundance with two within the parish and three in Blagdon alone. Perfectly located to enjoy the area s must-see locations from the historic spa city of Bath the metropolitan city of Bristol the picturesque scenery of Cheddar Gorge and Caves and Wells the smallest cathedral city in England as well as the local lakes of Blagdon and Chew Valley. Stepping inside this delightful accommodation you will be greeted by the entrance hall. Throughout the property are beautifully crafted original features exposed beams slate and wooden floors with carpet in the master bedroom. From the entrance hall go through an archway to the well-equipped contemporary kitchen with electric oven and hob fridge/freezer microwave and dishwasher perfect for trying out new recipes or old family favourites. Leading from the kitchen is a useful utility room with washing machine and space to hang coats and clean off muddy paws there is also a door that leads out to the enclosed courtyard garden. Back to the entrance hall and into the lounge/diner which has an impressive high ceiling with exposed beams and a feature window. Here you can relax on the comfy sofas while watching your favourite movie on the Smart TV in front of the wood burner effect gas fire. From here there are two ground floor bedrooms one double and one twin. There is also a ground floor bathroom with bath separate shower and WC. Heading upstairs to the first floor from the lounge/diner is the king-size bedroom with en-suite shower room and WC with low sloping ceilings within the en-suite as it is built in the eaves which is all part of the charm and character of this barn conversion. Venturing outside from the back door you will find yourself in an enclosed courtyard garden with patio area and garden furniture. It is a perfect spot to relax and enjoy your morning coffee or a spot of al fresco dining. Immediately to the side of the property is off-road parking for three cars. Beautiful property. Very well finished. A great place to stay in this beautiful area of the country. Off the beaten path, in the country, you will need a GPS to find this place. The converted 1880s barn is very new. Yes, an oxymoron to be sure. The construction and finishings were very modern, so you did not feel the age of the building at all. The vaulted ceilings caused terrible acoustics such that the guy watching tv could hear the people in the kitchen better than the tv that was blaring. The kitchen was very well stocked and made cooking a breeze. One person did not find the bed comfortable but I was ok with mine. The linens were hotel grade, so very nice. The bathrooms were wonderful, but needed furniture for items traveling guests need. Since pedestal sinks are installed, there are no counters. We ended up having to bring a small table upstairs to hold our toiletries bags. The two bedrooms on the ground floor lacked any storage for clothing or suitcases. The upstairs room has a nice clothing bar and shelf, plus chest of drawers. We loved that the new kittens made their first appearance upon our arrival. We were able to play with them a bit on our last day, that was an unexpected treat. The biggest issue we struggled with was no internet. I knew wifi was not provided, but since we had a hot spot I thought we could muddle through. But, for some reason it would not work at the house! It worked when we drove away, but not at the house. No internet is quite difficult for people trying to plan what do, where to go the next day & where to eat while on vacation.